Two swans stay close for warmth in Vadnais-Sucker Lake Regional Park this winter. Herb and June Radmann’s descendants are the Shoreview Historical Society’s 2019 Heritage Family. Students were presented with travel scholarships by Shoreview Einhausen Sister City Association board members at a recent German Dinner evening. (From left) organization President Bill Kiehnbaum, Vice President Cheryl Wason, Jett and Zoe Brownlee and Treasurer Roger Hintze. By attending this course, you will learn about the many ways to save for retirement as well as the advantages and disadvantages of each. You discover how to save money on taxes, manage investment risks and protect your assets from potential long-term health care expenses. Above all, this course shows you how to assess your ﬁnancial situation and develop a personalized plan to achieve your retirement goals. a liated. Insurance products provided by Great Waters Financial, a Minnesota insurance agency. Debbi Betts taught at Oak Hill Montessori School in Shoreview for 40 years. FREE IN-HOME NEW COOLING & HEATING SYSTEM ESTIMATES! Don’t forget, the seasons are changing! Gas forced air systems. Refrigerant not included. Block printing workshop Shakun Maheshwari will teach one of the oldest types of printmaking — block printing — from 4 to 6 p.m. Thursday, April 25, at Ramsey County Library – Shoreview. Learn the history of this traditional method of printing through design, image transfer and carving. Then make your own block print. experiencing pediatric cancer; Shoreview Library literacy and reading promotion efforts for kids; Mounds View Schools; and the Kids in Need Foundation, which provides school supplies. You can register online to attend at Eventbrite for $28 and tickets are available from Lions Club members for $25 each by cash or check. There will be no ticket sales at the door. Please contact Jim Zewers at zewersj@aol.com or Judy Zewers at jzewers@aol.com with questions about the event or sponsorship opportunities. with an adult paying full price. Topics include boating law, boat safety equipment, safe boating, navigation, boating problems, trailering, storing and protecting your boat, hunting and fishing, water-skiing and river boating. To register, visit shoreviewcommunitycenter. com. Poets discuss their art Ramsey County Library – Shoreview will celebrate National Poetry Month with readings and conversation between poets Alexis Pauline Gumbs and Ed Bok Lee, from 7 to 8:30 p.m. Tuesday, April 30. This event is funded with money from Minnesota’s Arts and Cultural Heritage Fund. Research family tree A Genealogy 101 event will be held from 6:30 to 8:30 p.m. May 13 at the Shoreview Library. Cathy Weber, owner of NorthStar Genealogy, will discuss how to get started researching your family tree. Representative appointed to operations committee Minnesota House Speaker Melissa Hortman announced state Rep. Jamie Becker-Finn (DFL – Roseville) was appointed on March 28 to join the Government Operations Committee. The committee provides oversight to local governments and state boards, commissions and task forces. The division also has jurisdiction over election policy. In addition to her new duties, Rep. Becker-Finn also serves on the committees on Taxes, Rules, Environment & Natural Resources Finance, Environment & Natural Resources Policy, and Veterans & Military Affairs. Ground-breaking celebration kicks off districtwide construction This spring marks the beginning of construction efforts at most schools across the Mounds View school district. To thank voters for their support and to celebrate the construction efforts at all sites, the district will host a single groundbreaking celebration located at Edgewood Middle School at 5 p.m. Tuesday, April 23, at 5 p.m. The public is invited to view displays of all construction projects approved by voters in 2017. The school is located at 5100 Edgewood Drive N., Mounds View. Individual schools will host ribbon-cutting ceremonies at their sites as construction is completed later in 2019 or 2020. To see the construction schedule for all schools, visit www.moundsviewschools.org/ facilities. Named Best Communities for Music Education In 2019, Mounds View Public Schools was one of only 10 school districts in Minnesota to earn the Best Communities for Music Education designation. It’s the seventh consecutive year the district was honored for demonstrating exceptional efforts toward maintaining music education as part of its core curriculum. Celebrate special education success The Special Education Parent and Professional Advisory Council (SEPPAC) will host “Celebrate Success” from 6:45 p.m. to 8:15 p.m. April 25. Celebrate Success is an annual event where the audience will have the opportunity to hear from a panel consisting of past and present students who have received special education services. Panel participants will share their post-secondary plans and aspirations and experiences in K-12 education. The event will take place at the District Center in the Shoreview Commons. University of Minnesota-Twin Cities: Katherine Clements, Samuel Kimball, Samuel Pickering and Nathan Torunsky, all of North Oaks. Retired pastor David Guenzel, 82, passed away Friday, April 5. Guenzel served at several parishes in ministry before reitiring from Incarnation Lutheran in 1993. He and his wife Sharon began attending Living Waters Lutheran Church in Lino Lakes in 2010 and he joined the staff in 2011. Most recently Guenzel served as the adult faith formation coordinator. A memorial gathering was held April 11 at Holcomb-Henry-Boom-Purcell Funeral home in Shoreview and a memorial service was held April 12 at Incarnation Lutheran Church in Shoreview. CITY OF NORTH OAKS NOTICE OF PUBLIC HEARING ON PRELIMINARY SUBDIVISION WILKINSON SOUTH AREA Notice is hereby given that a Public Hearing will be held on the Preliminary Subdivision 19-01, Anderson Woods Villas. This property is located off the south end of Osprey Court. The development would consist of four villa homes similar in character to the villa homes currently on Osprey Court. The public hearing for this Preliminary Subdivision will be held at the North Oaks Planning Commission meeting on Thursday, April 25, 2019 at 7:00 p.m. at the Community Room at 100 Village Center Drive, Suite 150. Please contact North Oaks City Hall at 651-792-7750 for additional information or questions. Michael Robertson, City Administrator mrobertson@cityofnorthoaks.com Published one time in the Shoreview Press on April 16, 2019. OFFICE OF THE MINNESOTA SECRETARY OF STATE CERTIFICATE OF ASSUMED NAME Pursuant to Chapter 333, Minnesota Statutes; the undersigned, who is or will be conducting or transacting a commercial business in the State of Minnesota under an assumed name, hereby certiﬁes: 1. The assumed name under which the business is or will be conducted is: Alpine Trucking 2. The street address of the principal place of business is or will be: 1164 Red Fox Road Arden Hills, MN 55112 3. The name and street address of all persons conducting business under the above Assumed Name, including any corporation that may be conducting this business. Energy Resources, LLC 1164 Red Fox Road Arden Hills, MN 55112 I certify that I am authorized to sign this certiﬁcate and I further certify that I understand that by signing this certiﬁcate, I am subject to the penalties of perjury as set forth in section 609.48 as if I had signed this certiﬁcate under oath. Dated: March 12, 2019 Signed: Nathan Lundeen Published two times in the Shoreview Press on April 16 and 30, 2019. Submitting Public Notices Including Foreclosures, Certiﬁcates of Assumed Name, Liens, Probates and all other Public Notice Requirements Contact: Lisa, Myrna, Ivy, Gayle or Evelyn E-Mail: Legals@presspubs.com Call: 651-407-1200 4779 Bloom Ave., White Bear Lake, MN 55110, www.presspubs.com, 651-407-1200 • Monday – Friday 8 a.m. – 5 p.m. DATE AND CAST SUBJECT TO CHANGE. STARS ON ICE AND LOGO ARE REGISTERED TRADEMARKS OF INTERNATIONAL MERCHANDISING COMPANY, LLC. ©2019 ALL RIGHTS RESERVED. still remember when one of my childhood friends made a big announcement: she no longer believed Santa Claus was real but she still believed in the Easter Bunny. While her thinking seemed illogical to me, I tried to understand where she was coming from. As for me, I never remembered believing Santa Claus was anything but a fun person in a suit. My theory about the Easter Bunny was built off my theory of Santa Claus. But for my friend, who had believed the Santa Claus story for years until she realized Santa Claus looked, sounded and acted differently at the mall every year, the Easter Bunny offered a more believable alternative. The Story Easter Bunny was rather elusive in the ‘90s. He didn’t show up at Chaser many community Easter egg hunts Sara Marie Moore like he does today. A child couldn’t see the Easter Bunny appears to be a person in a suit, so it could make sense the mysterious bunny ﬁ lled the ﬁelds overnight with plastic chicken eggs. I didn’t tell my friend but I was still convinced that the Easter Bunny was also a person in a suit. This week, millions of people around the world will celebrate the resurrection of Jesus, a man who was cruciﬁed about 2,000 years ago for claiming to be God in human form. The report of his resurrection is what has caused millions of people around the world to believe his claims to be God and build their lives around his teachings recorded by four ﬁ rst-century reporters: Matthew, Mark, Luke and John. Over the centuries, several theories have surfaced to try to refute the reporting of Jesus’ resurrection, according to the “Handbook of Christian Apologetics” by Peter Kreeft and Ronald K. Tacelli. First, some people have theorized that Jesus did not really die on the cross but that he was simply revived after resting in the tomb. However, John reported that blood and water came from Jesus’ heart when it was pierced by those checking to make sure he was dead. Death by asphyxiation or hypovolemic shock would cause water to build up around the heart. Others say perhaps the disciples hallucinated that they saw Jesus after he died. However, people touched Jesus after he rose from the dead. He was consistent in his appearance and personality. He appeared to multiple individuals and groups for over a month. Group hallucinations are rare. Luke reported about 500 people saw Jesus at once after he was resurrected. When the Apostle Paul was spreading the report of the resurrection further west, he noted that many of these 500 were still alive, available for questioning. Another argument against the resurrection is that Jesus’ followers and the reporters created a conspiracy. It is not very plausible such a conspiracy could have been perpetrated considering how difﬁcult it would have been to take Jesus’ body from a guarded tomb and destroy the evidence so quickly. Conspiracies are usually found out, especially when a group has adversaries. It is doubtful that 3,000 people in the area would have become Christians within a couple of months if the resurrection had been made up. That a man named Jesus rose from the dead in the Middle East about 2,000 years ago is not really a disputed fact of history. Who you think he was, how and why he rose from the dead and what it means for your life is a matter of personal decision and faith. As for me, I still believe He was God in a human suit. If those reporters got the resurrection right, I believe they quoted Him accurately, too. Sara Marie Moore is editor of the Shoreview Press. She can be reached at 651-407-1235 or shoreviewnews@presspubs.com. innesota has long had a reputation for being a leader in education. In talking to members of the community last fall and listening to constituents now at the Capitol, it’s clear Minnesotans value world-class schools and quality opportunities for students to achieve. I’ve learned that many of you, like me, live in our community in large Legislative part because of our excellent school Lingo district. Those who don’t currently Kelly Moller have children in Mounds View P bli S h l recognize that the Public Schools strength of our schools positively impacts our property values. Unfortunately, in the early 2000s, school funding was slashed to balance the state budget. A generation later, school districts have yet to recover from the devastating consequences such as fewer teachers, larger class sizes, and diminished programming. Districts have been forced to ask local communities to contribute more through operating levy increases, which has exacerbated disparities among districts. Minnesotans have made clear to us how much they value strong funding for our K-12 classrooms. for a tuition freeze. This will both lower costs for students and families as well as strengthen the quality of our institutions. Along with new funding for the Minnesota State Grant Program, we can meaningfully address the staggering amounts of debt students build up. Minnesota ranks ninth in the nation for student loan debt. This isn’t a ranking to be proud of. It’s critical to encourage our next generation of Minnesotans to develop passions and ambitiously aspire to reach their hopes and dreams. This takes hard work, resiliency, and perseverance to overcome challenges. Just as we expect our children to think big and demonstrate dedication, our children should expect Minnesota’s leaders to do the same when it comes to strengthening their future. As the mother of two sons, I can’t imagine how different their outlook would be if they didn’t have terriﬁc teachers and wellrounded curriculum enabling them to achieve. I’m committed to delivering the resources ensuring all Minnesota students can have these opportunities to succeed well into the future. Rep. Kelly Moller represents all or part of Shoreview, Mounds View, Arden Hills, and Spring Lake Park in the Minnesota House. writer about the same subject editing. matter will not be published. • Deadline is 5 p. m. , Wednesday • Submissions containing libel- of the week prior to publication. ous or derogatory statements • To submit a letter, e-mail it to will not be published. shoreviewnews@presspubs. • Submissions containing facts com, fax it to 651-429-1242 not previously published in or mail or deliver it to Press the Press must be accompaPublications, 4779 Bloom nied by factual veriﬁcation. Ave., White Bear Lake, MN • All letters are subject to 55110. COPYRIGHT© 2019 BY PRESS PUBLICATIONS, INC. Material may not be reproduced in whole or part in any form whatsoever. Published bi-weeklyTuesdays by Press Publications, Inc.
the more I pay attention, the more I believe that we need to testify to the miraculous work of the Holy Spirit in our lives and in our world, and point to the hope that that brings! And not just the big moments, but all the small moments too, as those ‘threaded together moments’ become the balm for our united aching souls. We need to speak of how this God of ours changes the mundane (and the painful) into the front lines of Kingdom expansion. Maybe this faith practice of paying attention isn’t so bad after all? My hope and prayer is that you experience the joy and new life of Resurrection as God continues to reveal where the Easter moments are in the world around us. Pastor Renee Patterson ministers at Shepherd of the Hills Lutheran Church in Shoreview. Building a Better Community through Charitable Giving By connecting the generosity of people with the evolving needs of Shoreview, the Shoreview Community Foundation enriches our quality of life. The Foundation provides grants according to predetermined guidelines to non-proﬁt organizations or units of governmental from its permanent endowment fund. There are many options for making undesignated or designated, tax deductible gifts or bequests by will or trust. SHOREVIEW AREA EVENTS Event details are subject to change. Please contact the event organizer to verify information prior to attending. 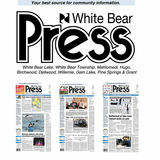 See Press Publications’ website www.presspubs.com for stories from the White Bear Press, The Citizen, Vadnais Heights Press, Shoreview Press, Quad Community Press, The Lowdown-Forest Lake Area and The Lowdown-St. Croix Valley Area. SPRING TEA When: 1:30-3 p.m. Wednesday, May 8 Where: Shoreview Community Center, 4580 Victoria St. N. Details: Dress in fancy attire and wear a favorite spring hat. Bring a teacup and pot if you have one to share; variety of teas and appetizers served. Registration required; $14. When: 4-6 p.m. Thursdays Where: Shoreview Library, 4560 Victoria Street N. Details: Teens can drop in to check out the new teen area and make stuff with the 3D printer, NEIGHBORHOODS sewing machine, Cameo NEARBY cutter and more. Free. Contact: 651-724-6006 or rclreads.org “ANIMAL FARM” When: 7 p.m. Thursday, FAMILY STORY TIME April 18; 7 p.m. Friday, April 19; 1 p.m. When: 10:30-11 a.m. Saturday, April 20; 7 Mondays p.m. Wednesday, April Where: Shoreview Library, 4580 N. Victoria 17 Where: Haniﬂ Street Performing Arts Center, Details: Stories, songs 4941 Long Ave., White and ﬁ ngerplays for Bear Lake children ages 2-5 to Details: Lakeshore enhance early literacy player’s Kids & Family skills. Ramsey County Sheriff Bob Fletcher, right, signs a collaborative memorandum of understanding to improve law enforcement response to sexual assaults. White Bear Lake Police Chief Julie Swanson is in line to do the same, along with all Ramsey County law enforcement agencies, the Ramsey County Attorney’s Office and Ramsey County Public Health. 2015 and 318 in 2018. There has also been a 19% increase in cases charged and a 17% increase in convictions. Still, the percentage of cases charged compared to the number of sexual assaults reported to police has not changed. Choi expects that will change as collaboration continues. And Choi continues to push for more resources. “We talked about a year ago that nothing is going to change unless the public, our community, invests in more resources,” he said. In the next two years, $750,000 of public investment will go toward improving outcomes for victims of sexual assault. “As more victims come forward to the law enforcement, it is so critical for us in this community to get this right,” Choi said. “We are working very hard to do that.” Fletcher said victims can report past incidents to law enforcement as well. Choi also encourages victims to report past incidents without worrying whether or not there is enough evidence or it has passed the statute of limitations. “A lot of our perpetrators are repeat offenders,” Choi said. “Your story and your voice are an important part of ensuring justice in the community.” Victims can report sexual assault incidences by calling 911. Past incidents can be reported to the county’s non-emergency line at 651767-0640. If a victim would rather speak to an advocate before speaking to law enforcement, they can call 651266-1000. • A 46-year-old local man slugged his 39-year-old fiancée, also from Shoreview, on St. Patrick’s Day in the 800 block of Cannon Avenue, “possibly” breaking her nose. Charges of fifth-degree assault, domestic assault and disorderly conduct are under review by the city attorney’s office. investigation is underway. • A business in the 500 block of Cardigan Avenue reported attempted fraud March 21 when checks were found to be altered, duplicated and cashed. An investigation continues. • A unique twist on the “send back the excess amount” scam occurred in the 4100 block of Rustic Place on March 22 when a homeowner, offering an item for sale, received a check for greater than the asked-for amount. The seller was asked to deposit the check and send the excess amount to an unknown third party for “moving expenses.” The check was found to be fake and the fraud unsuccessful. • Juvenile residents at an address in the 1600 block of Pinewood Drive called 911 the evening of March 22 about an unknown person at their door. The stranger was gone when deputies arrived. One of the swans Vadnais Lake Area Water Management Organization Community Development Coordinator Dawn Tanner retrieved from Vadnais-Sucker Lake Regional Park in March. The University of Minnesota later determined it had died from lead poisoning, likely from lead fishing sinkers. YOU SHOULD KNOW: The Minnesota Pollution Control Agency maintains a list of manufacturers and retailers of lead-free tackle. You can find the list at pca. state.mn.us/living-green/manufacturers-andretailers-nonlead-tackle. This swan was found dead and frozen on the ice in Vadnais-Sucker Lake Regional Park in March. The University of Minnesota later determined several swans in the area died from lead poisoning. free bullets, shots and fi shing tackle, and prevent pollution in general. In the summer, you might see Hartmann canoeing on White Bear Lake and photographing eagles and herons. She posts her wildlife photography at debbiehartmann.com. White Bear Lake wildlife photographer Debbie Hartmann counted 75 swans in Vadnais Vadnais-Sucker Sucker Lake Regional Park this winter. A swan climbs a snowbank in Vadnais-Sucker Lake Regional Park. 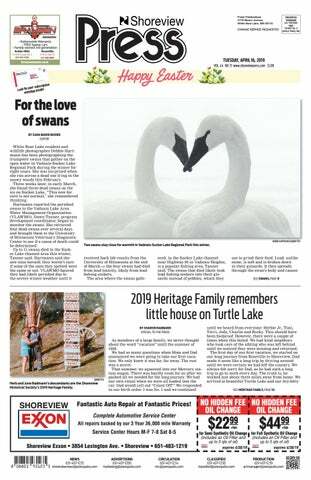 “When I see under their wings, I think they are like a work of art,” said White Bear Lake wildlife photographer Debbie Hartmann. DRINKING ON A PATIO COUNTS AS AN OUTDOOR ACTIVITY. Herb and June Radmann in a Model T.
of Herb and June Radmann. The descendants of the Radmanns are the Shoreview Historical Society’s 2019 Heritage Family. Remodeling Resources Enjoy Spring and Summer on your new Screen Porch and deck! Call Mike now – so you can enjoy the Seasons! Pictured (counterclockwise from top left) are Scouts BSA Troop 65 Assistant Scoutmaster Pam Smith, Scouts Sophia Engler, Elisabeth Bley and Anna Peterson, Scoutmaster Terri Johnson, and Scouts Michaela “Micah” Vacco and Maren Johnson. Not pictured is Scout Roz (last name omitted by request). ships can thrive. Michaela “Micah” Vacco called Scouts a “great place to learn how to fail,” because there is a community that is always supportive. Maren echoed this sentiment, saying, “Normally, when you fail in life, you know you’re getting judged ... but when you’re at Scouts and you mess up horribly, you laugh it off, you get a friend to help you through it, and you know nobody’s going to judge you.” She might be speaking from experience. When Maren’s troop had to run or walk a mile to fulfill a Tenderfoot rank requirement, she finished last because of an ankle injury. Yet even after the other girls had completed their mile, they went back to run Maren’s last laps with her. With this newfound support, Maren gained confidence to finish the race. Q & A with Emily Shilson, Minnesota’s best female wrestler, who’s finally done wrestling boys out for the sport. I hope they continue to build on what they have going over there. The best way to grow the sport is to get more girls involved. Emily Shilson has been wrestling against boys, and usually winning, for about a decade. But that’s over, now that she has completed her senior season in high school. Shilson looks ahead to wrestling against women at one of the 33 colleges that offer the sport. She hasn’t picked one yet. She will continue to pursue her ultimate goal — the Olympics. Already, she is a 2018 Cadet World Champion and 2017 silver medalist, and a 2018 Youth Olympic Games Champion. Shilson wrestled for Centennial for four seasons and Mounds View her senior year, all at 106 pounds. She qualified for the state tournament the last three years, as a section runner-up and twotime section champion. She was never able to win a match at state, in three individual tournaments and two team tournaments, but posted a 139-64 career record, including 88-20 the last three. The Shilsons are a wrestling family. She followed her brother Tyler (who placed second and fourth in state tournaments for Centennial) and father Chad in wrestling, with Chad handling much of her coaching. Shilson, who carries a 4.03 grade-point-average, was recently named Ms. Minnesota Wrestling by The Guillotine. She won her division at the Minnesota Girls High School Wrestling Tournament all six years. Are you all done with wrestling against boys now? Officially, I’m done competing against boys. I also just wrestled my last career Folkstyle match at the Girls Folkstyle Nationals last weekend. I split time this high school season between Freestyle and Folkstyle but will now focus 100 percent of my time on the international styles of Freestyle and Greco. What did all these years on high school teams do for you in terms of development, confidence-building, fun and relationships? My six years of high school wrestling have been so much fun. I’ve made a lot of friends but best of all, I got to compete with my brother for four of those years and we were on two state tournament teams together as well. Not many brothers and sisters can say that. In terms of development, I’ve learned to operate while being banged up. I’ve had injured shoulders, knees, ankles, wrists, feet, toes fi ngers — you name it. I had a bad knee infection during the fi rst eight weeks of my junior year that we didn’t really tell anyone about. I picked it up while training in Japan just prior to the season starting. If you were to go back and watch fi lm from that time, you might notice a few differences. I’ve developed an extremely good diet and strength training program during my high school years. That again is thanks to Dr. Josh at Body Rejuvenation. Bruce Strand of Press Publications recently contacted Shilson for a question-and-answer session. Was it a major goal to get at least one state tournament win, a big disappointment to not get one? My goal was always to win the high school state tournament. It was the media’s goal for me to win one match. I train with the mindset to win every match. Are you glad now that it’s going to be all women from now on? It’s not that I’m glad I’ll only be competing against other female wrestlers from now on but it’s more about that is the direction our sport needs to go if we want to see it grow like it has from the male side. I’m simply glad that I get to compete. I’m grateful for the opportunities that this sport has provided me. When a boy at state beats you, is it because he’s stronger and/or quicker? Boys in high school are building muscle at an extremely fast rate which makes it next to impossible for a girl to keep up with them from a strength perspective. Because of that, when it’s match time against a boy, I know that I’m going to rely on my technique more so than anything else. I still feel I’m pretty strong and have a great strength program thanks to Body Rejuvenation. What was the reason for transferring to Mounds View this year? I transferred to Mounds View because it was the best place for me to spend my senior year. My teammates, coaches and fans were so supportive of me all year long. I couldn’t be happier. What is next for you, this year, on the mats? Emily Shilson at this year’s state tournament. I’ve got the U.S. Open in April, the Junior World Team Trials, the U23 World Team Trials and the Senior World Team Trials all in May, Junior Nationals in July and all throughout the year, I’ll have training camps through the U.S. and overseas. I plan to major in fi nance and have narrowed my college choices down to three schools. I will be making the final decision very soon. I’m extremely excited to wrestle in college as well. It’s easy and FREE! Respond electronically by e-mailing to art@presspubs.com and attach a .JPG of your hero, also include their name, branch of service, rank and where they were stationed. Mustang seventh-grader seventh grader Emmanuel Alex won his varsity debut at No. No 4 singles. Bjorn Swenson won a duel of highly-ranked players at No. 1 singles against Edina. ning the third set 6-4 over senior Kenneth Diao and eighth-grader Hank Trondson. Johnny Yue and Christo Alex lost in the third set 6-4 at No. 1, while Peter Culp/ Jesse Bergstrom lost in straight sets at No. 3. Text Only- Limit to 50 words. 3.32" x 2.5", entries subject to edit. Email photo & 50 words or less to classiﬁed@presspubs.com Place your ad in your hometown paper & lift to o any other paper for additional $15. Deadline Wed. at 4 p.m. Sample Only Package C - not to size. Share your news — Place a celebration announcement! Mustang softball (1-2) tops Roseville 8-1 Mounds View softball has a 1-2 record, with a loss to Park 7-4, a win over Roseville 8-1 and a loss to White Bear Lake 9-3. Against Roseville, Maya Patty went 4-for-4 with two runs and two RBI’s, and Amberly Langer 2 was 1-for-4 with three RBI’s. Caitlyn Tesko was winning pitcher. Did you win the big game? last of the seventh, Batemen led off with a double, took third on Stenstrom’s single, and scored on an infield grounder by Will Rogers for the game-winner. Solfest pitched four innings (two runs, five strikeouts). Robert Hogan threw three innings (one run, two hits, one strikeout) and got the win. Solfest also started a double play that got him out of a fi rst-inning jam. Mounds View baseball, coming off a state championship American Legion season last summer, has started the 2019 season with two wins. The Mustangs beat Osseo 8-4 at home on Monday, April 7, led by Brett Bateman, who went 4-for-4 with a double, two RBIs, three runs and two steals. He also pitched two shutout innings in relief. Flowers get a healthy watering at Costa Farm & Greenhouse. The Costa family poses for a photograph. Pictured (from left to right) are Ron, Grace, Gina and Karin. Ileen Costa, mother of current owner Ron Costa, and Zack Slater plant red cabbage (approximately 1982). Frank Watson is a local Meteorologist who operates a weather station in White Bear Lake. Weather data and observation are from his weather station and trips around the area. Frank can be found on the internet at WeathermanWatson.com. “THE BEST OF ENEMIES” (PG-13) [THEMATIC MATERIAL AND SOME VIOLENCE] — After a fire closes the African-American school in Durham, North Carolina in 1971 and a NAACP leader (Babou Ceesay) holds a two-week summit to decide whether to integrate schools in this powerful, inspirational, star-studded (Nick Searcy, Wes Bentley, Bruce McGill, Caitlin Mehner and John Gallagher Jr.) 133-minute film based on Osha Gray Davidson’s novel “The Best of Enemies: Race and Redemption in the New South,” tenacious African-American civil rights and fair-housing activist Ann Atwater (Taraji P. Henson) with a teenage daughter (Nádej Kyla Bailey) and Ku Klux Klan leader and gas station owner C.P. Ellis (Sam Rockwell), who has a wife (Anne Heche) and three children (McKenzie Applegate, Brody Rose and Carson Holmes), eventually and surprisingly find themselves developing a friendship while coming together on common ground on the issue of school integration. “BREAKTHROUGH” (PG) [THEMATIC CONTENT, INCLUDING PERIL] — When their 14-year-old, basketballplaying, adopted son (Marcel Ruiz) was pronounced dead for more than 45 minutes and ended up comatose in a Missouri hospital after drowning in January 2015 in this heartwarming, inspirational, Christian-themed, 116-minute film based on Joyce Smith’s memoir, faith and prayer bring together a distraught couple (Chrissy Metz and Josh Lucas), their pastor (Topher Grace) and townsfolk (Sam Trammel, Mike Colter, Taylor Mosby, et al.) when a world-renowned drowning specialist (Dennis Haysbert) believes there is not much chance for recovery. April 26, 1986 was when the Chernobyl nuclear plant in the Ukraine exploded. The radioactive cloud created forced a 300-mile radius to be evacuated. “THE HUMMINGBIRD PROJECT” (R) [LANGUAGE THROUGHOUT] — An engaging, quirky, witty, unevenly paced, 111-minute Kim Nguyen thriller in which a cigarette-smoking, wheeler-dealing hustler (Jesse Eisenberg) with stomach cancer and his computer whiz cousin (Alexander Skarsgård) determine that they can make millions to the chagrin of their former boss (Salma Hayek) by laying an underground fiber-optic cable between Kansas and the New York Stock Exchange servers in New Jersey and reducing the transaction speed by a millisecond in the world of high-frequency trading. Many of you, like my neighbor Maggie, had put away your APRIL 17 - 23, 2019 snow shovel for the winter. Last Wednesday around noon I High 61° saw her taking it out. Last week I totaled 8.1 inches of snow, Low 38° ice and hail. Unlike Maggie, I refused, REFUSED to take my shovel out. Yes, the ﬁrst couple of days driving through the %Sun 56% snow was tough. I had to blast through the snowplowed bank PCP 0.89” at the end of the driveway, but I did it. Most likely, other than maybe a few ﬂakes, that will be the last of our snow. White Bear Lake level update: November 15, 2018, 924.0 feet. April 15, 2019, 924.8 feet. www.krinkies.com When you need us, we are here to help. Happy Hour! Everyday 3-6 pm! Rosetown American Legion Post #542 700 West County Road C • Roseville (Turn at Rosetown Court) 651-483-3535 • www.Roserownlegion.com Always welcoming new Legion, S.A.L. and Auxiliary members. Inquire within. r u o H y p p a H Special highlighted here! Call 651-407-1200 to place your ad here! The red portion of a trail in Vadnais-Sucker Lake Regional Park has been closed due to high water. Get offline and get in line! High School & College students coming by bus! Learn more about job opportunities available where you live! Meet representatives from employers and organizations looking for candidates for a range of job opportunities from full-time, part-time, seasonal, and volunteer positions! Suitable for entry-level, new grads, professional careers, seasoned experts, returning to the job market, or looking to make a transition! In addition to meeting employers and organizations, take advantage of resources and services to improve your success! Enroll Now For Summer or to Finish Up The School year Strong! Biweekly newspaper covering Shoreview and the surrounding area.